The third book in the hilariously scary Nightmares! 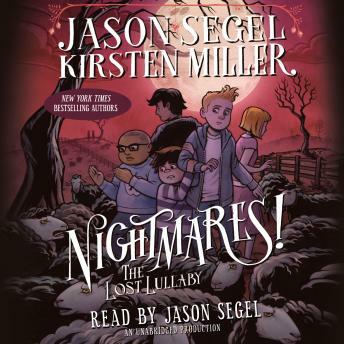 series by New York Times bestselling authors Jason Segel and Kirsten Miller is here! You thought the nightmares were over? You better keep the lights on! Not since he faced his fears has Charlie had so many bad dreams. Whenever he falls asleep, he finds himself in a Netherworld field, surrounded by a flock of CREEPY BLACK SHEEP. They're not counting sheep. They refuse to jump. In fact, they don't do much at all. EVEN EERIER, THOUGH, is that it’s not Charlie’s nightmare. Somehow he’s trapped in someone else’s bad dream. And he’s pretty sure the twins ICK and INK are responsible. Charlie and his friends thought they’d put the twins out of business, but it seems they didn’t quite finish the job. Now the WOOLLY NIGHTMARES are closing in, and INK has shown up at Cypress Creek Elementary! Charlie’s convinced that INK is up to NO GOOD. And if he’s right, it could be a very long time before anyone’s dreams are sweet again.